The breakout boards came bubble-shrink wrapped which was a little unexpected. I thought they'd just come loose in a ziplock bag or something. Interestingly enough, the SOIC-8 boards are half the thickness of the SOIC-16 boards, which are a regular thickness circuit board. Both have sets of holes (standard 0.1" spacing) to solder header pins to, making them convenient to use in breadboard projects. Or you could just solder wires to them if that's what the project calls for. Off to the workbench to do some soldering. 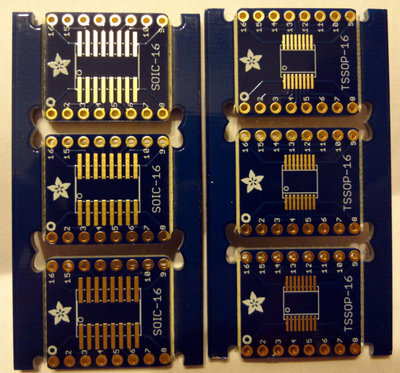 For SMD parts, these are actually pretty large, and soldering is relatively easy. First, tin one of the pads and then with tweezers, line up the IC and then heat up the tinned pad. 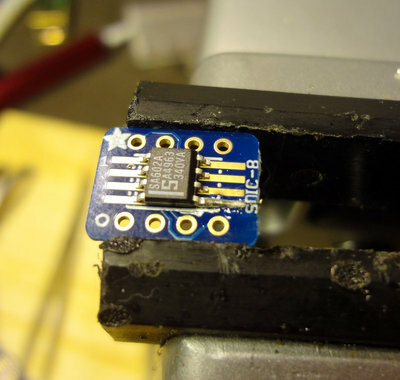 Use the soldering iron to push the solder towards the IC pin and you're done. Pro tip #1: Don't do this with the board clamped in a vise, or if you do, don't leave the soldering iron on the board for too long. 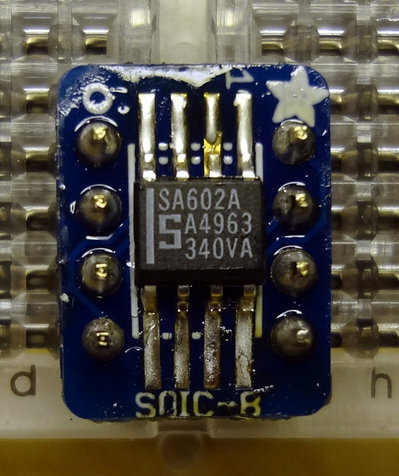 These SOIC-8 breakout boards are pretty thin and too much heat will make them melty. Oops. Once you're done, it's time to add some header pins. This part is easy. 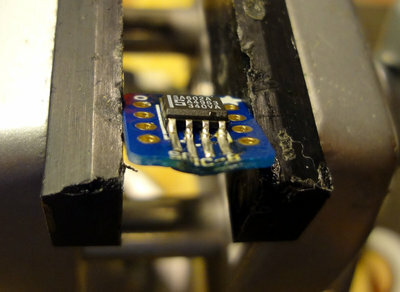 Stick the header pins into a breadboard, put the breakout board on the header pins and solder. 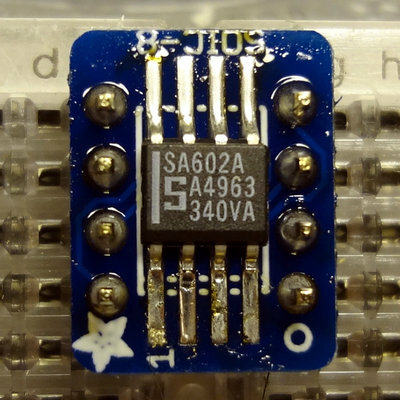 Pro tip #2: In your enthusiasm to solder, don't forget to pay attention to where Pin 1 of the IC is supposed to go (ignore that bad solder job on Pin 2...easy to fix). That stripe on the SA602 should be where the 1 is printed on the board. Oops. Lookin' good, lookin' good Eugene. You're putting me to shame - I have yet to use any of mine!